… but many don’t have a clue of what’s involved. AROUND 78% OF the population will soon be facing the prospect of forking out for water charges. However, people who rely on their own private supplies will be able to avoid the charges for drinking water (waste water charges may still apply), and now many are hoping to follow this same route. Well drilling companies around the country are reporting a massive surge in demand as the public looks for an alternative water supply, but for a lot of people it is simply not possible. Eimear Briody of drilling company Tom Briody and Son, based in Co Meath, said business has picked up ‘massively’ in the past few months. People are now looking for independent supplies for their residential homes or farms, or people who are on the mains are looking to get off it. Briody said that to drill a well at least an acre of land, no nearby pollutants, a safe distance from a septic tank, and also room for the machinery to get in is needed. That can be a stumbling block, because as seen in the video below, the rigs can be quite large. The Institute of Geologists of Ireland has published guidelines on what exactly is needed. The rise in demand was echoed by another drilling company in Waterford, Seery Water Services. “There has been a big uptake with the water charges coming into effect. More people are looking to go down the route of being independent,” Clare Seery said. Some companies have relished the upturn in business, but it isn’t particularly welcome for some companies, as their phone is ringing constantly. Another significant drilling company, who declined to be named, said they have been inundated with calls from people looking to have their own well installed to avoid water charges, but don’t understand what’s involved. “They call up, keep you on the line for 15 minutes with 101 questions, and can be a bit irate about the situation of having to pay for water,” one employee said. They said if someone lives outside of a town on at least an acre of land, it’s usually no problem, but for people on the outskirts of a town it’s just not possible. They don’t realise the can of worms they’re opening. While only a minority of homes can have their own private well, there aren’t many hoops to jump through. No planning permission is currently needed, but the costs of building a well can quickly mount. 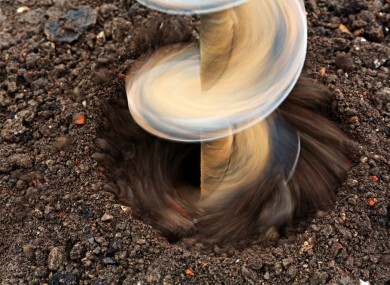 A geological survey of the site must first be carried out to gauge whether a well would be viable, although this is frequently offered for free. After this, the actual digging and lining of a well alone usually costs between €2,000 and €3,000. This depends on how high the water table is and so how deep the well needs to be. Trenches need to be dug to pipe the water to the house, and a pump and water treatment systems (which, depending on the quality of the water, can be quite expensive) installed. The pump and treatment systems will also need to be serviced each year. The cost of this will vary depending on the type of water in your area. Another variable is how much room is all this equipment going to take up – you may need to build a pump house. This massive array of factors means that it’s worth properly working out the cost of installing a private well. It’s likely to pay for itself, but not in the immediate future. Customers can contact us and we will update that they are no longer customers, however, we will carry out spot checks to ensure the information provided is correct. Email “A lot of people want to drill a private well before water charges come in...”. Feedback on “A lot of people want to drill a private well before water charges come in...”.